Graveyard Shift Sisters is gifting a curated care package to bring some more sunshine to what we hope is your fruitful and pleasant summer. 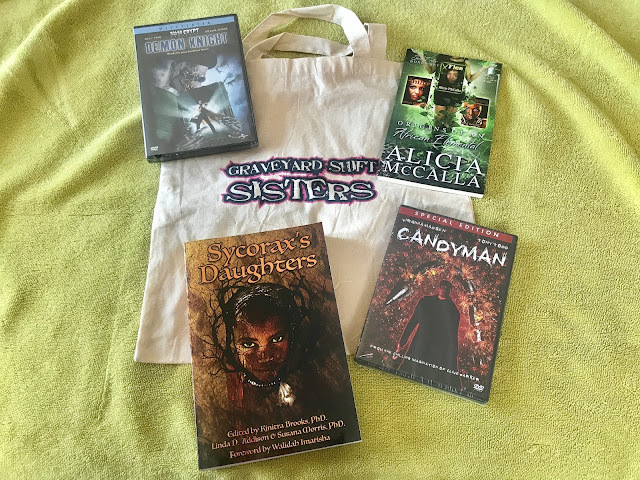 In order to win, simply tag the @GraveyardSister account on Twitter in photos of independent people of color artists that produce work in the horror genre including authors, actresses, designers, make-up artists, print illustrators, and filmmakers with links and why you love their work. It is consistently necessary to expand and celebrate the network of those in the horror community who beat the odds daily simply by not giving up. We want to be a part of the encouraging anchor that gives them the attention and recognition they deserve. You can tweet as much as you'd like. The deadline for tweets is Sunday, August 6th. The winner will be notified on Monday, August 7th.